Hi friends! Matt, Riese, and I are back from our big weekend in Boston for my brother’s wedding! It was a wonderful weekend and so fun to celebrate the happy couple. 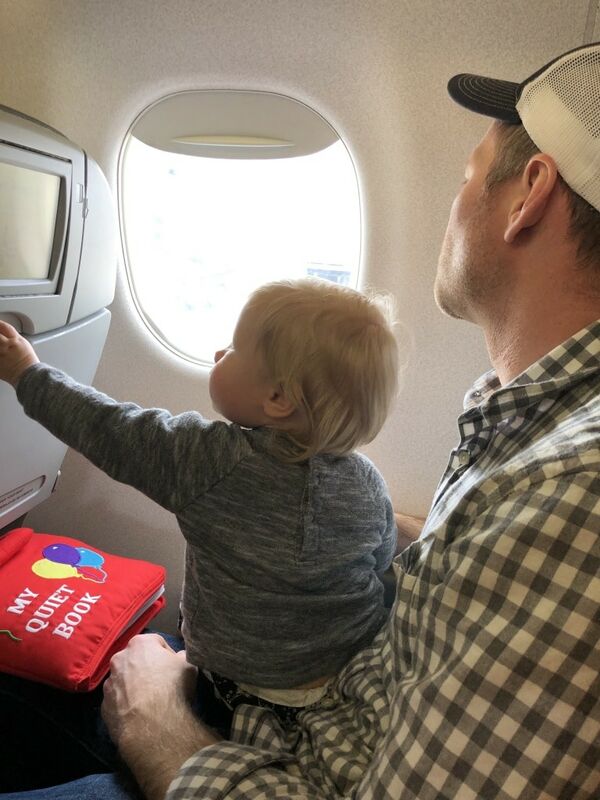 We flew up on Friday, which was Riese’s third airplane ride (the first two being when we went to Florida for vacation back in December). Man, traveling with a toddler is… exhausting, even with a 2:1 ratio! The last time we traveled, she was hyper on the plane, but in the airport I just had her in the carrier most of the time and she was fine. This time, she was on the move and did not want to be contained! 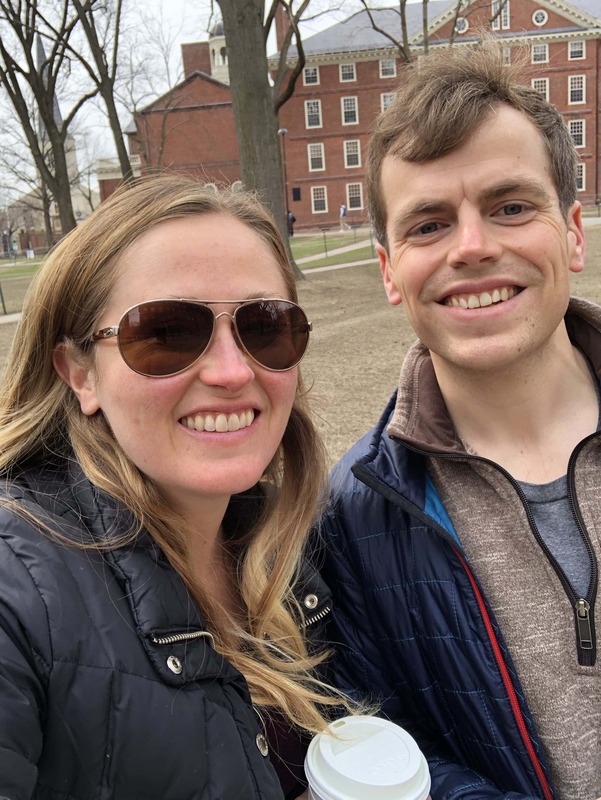 We arrived in Boston around lunchtime and met up with Matt’s parents at the airport – they offered to come to Boston for the weekend to take care of Riese while we were at the wedding festivities – very grateful for them! We grabbed some sandwiches in the airport and shared them with Riese on our ride to the hotel. Riese was really ready for a nap when we arrived, so we got her down, and Matt offered to hang out in the room while she slept so I could meet up with my brother Steve! Steve had about an hour to kill before needing to go get ready for the wedding rehearsal, and his bride Roxanne was off having her hair done, so it worked out that we had a little one-on-one time before the wedding madness began which was a nice treat. 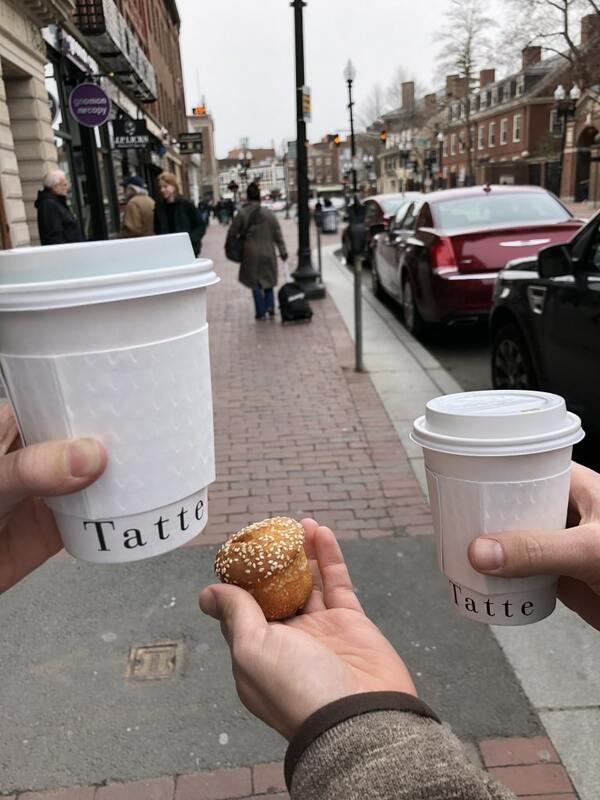 First stop: Tatte, a cute cafe, for coffee + a snack while we walked. 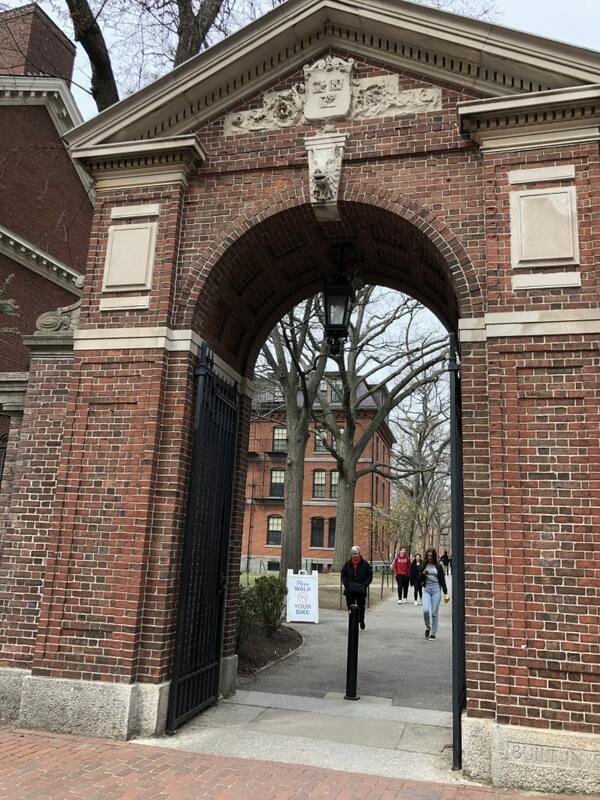 Then we walked around and explored Harvard, where Steve is in grad school. Once Riese was up, I met back up with Matt and we took her out to explore a little too. 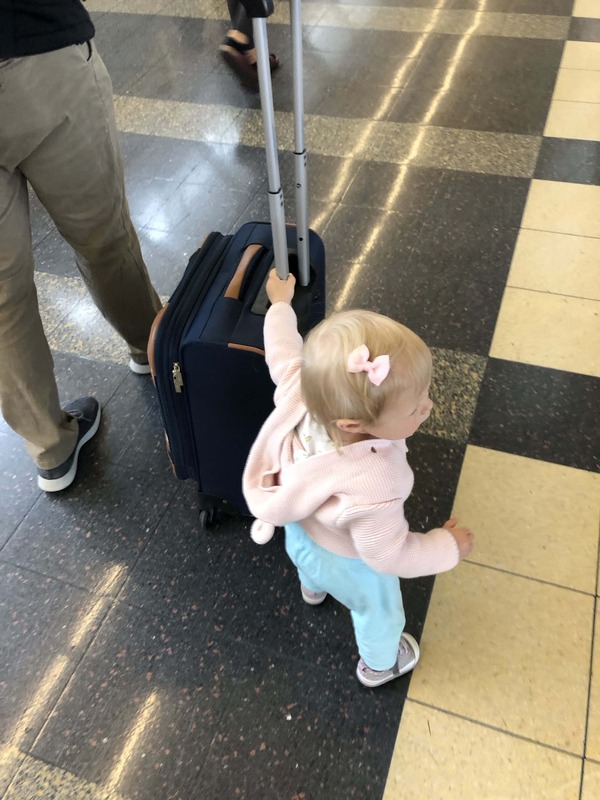 Sidenote – if you’re traveling with a little one and don’t want to deal with lugging a pack ‘n’ play, stroller, or other baby gear through the airport, look into local baby gear rental companies. 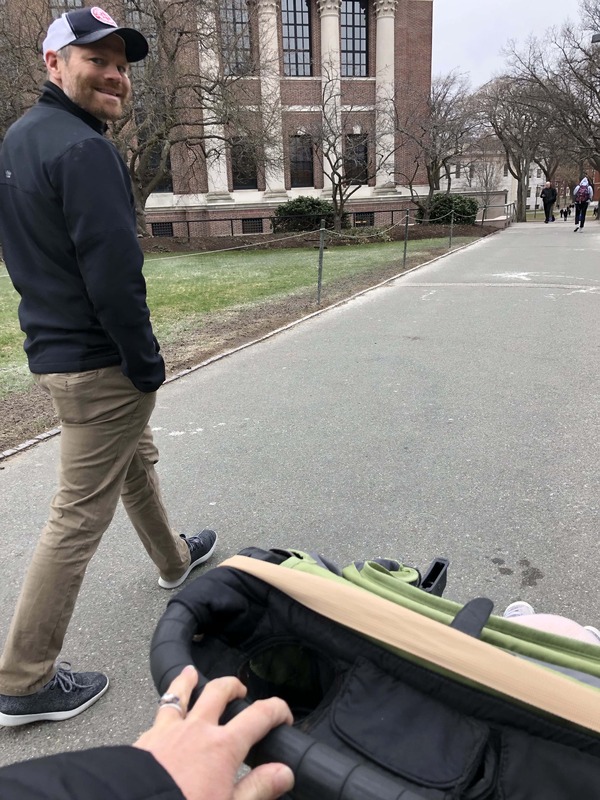 We rented a pack ‘n’ play and a stroller (they ended up giving us the City Mini, which I was excited about because I’ve been wanting to try that stroller – it’s nice and compact and handles really well) and it ended up being cheaper than it would have been to check both at the airport. For car seats, look at local cabs/shuttles that offer car seats, or use Uber car seat option. 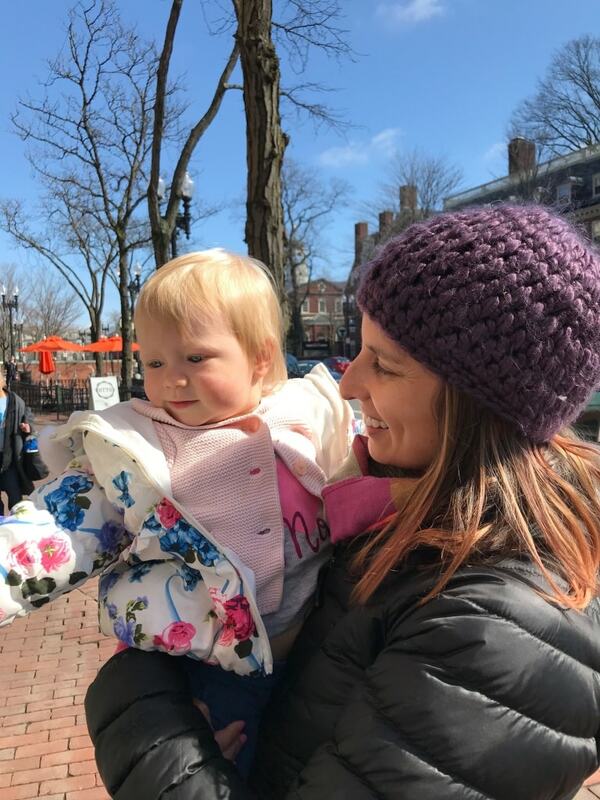 Since we would just be taking cars to and from the airport but could walk everywhere once in Boston, it wasn’t worth it for us to bring our car seat with us. 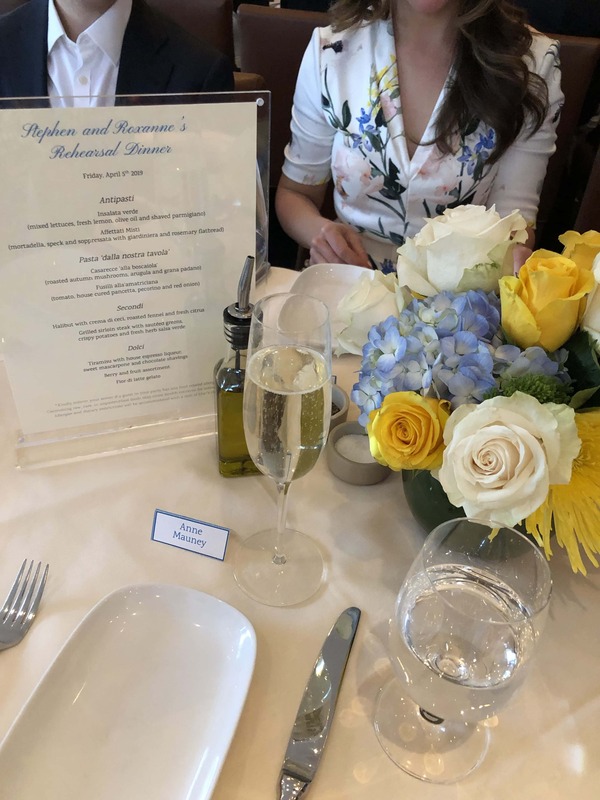 After exploring, Riese went off with Matt’s parents to have some dinner, and Matt and I headed off to the rehearsal dinner, which was at Benedetto restaurant in the Charles Hotel. The food was delicious, too! 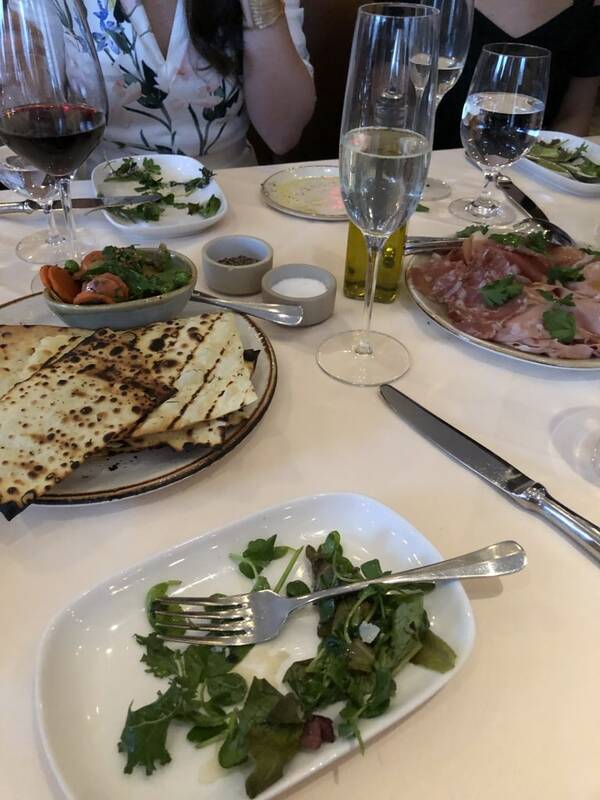 Everything except the starter salads and the dessert were served family style. 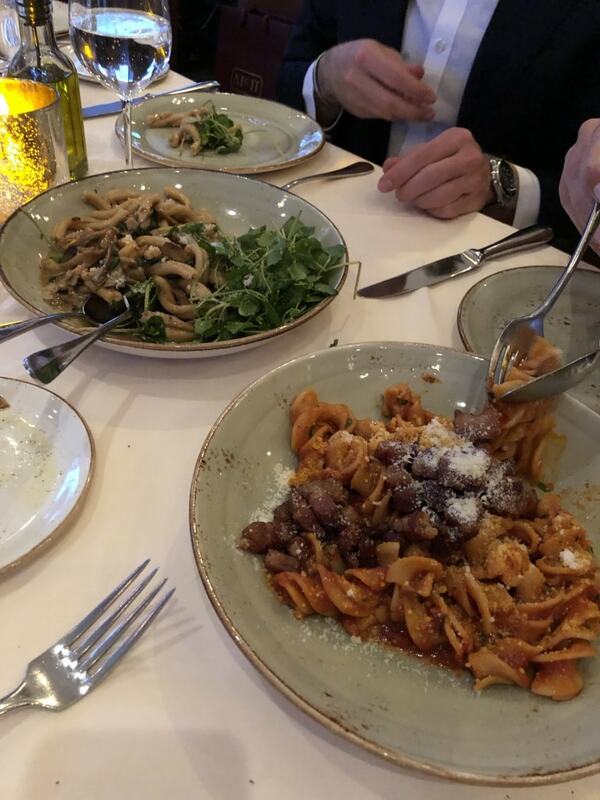 There was also a steak course I forgot to get a photo of, probably because I was already full from the pasta, which was DELICIOUS! The steak was amazing too though! On Saturday morning, the wedding festivities continued with a “runaway bride 5k”! There were nearly 50 wedding guests of all ages taking part – amazing, right? We were so impressed with the turnout! 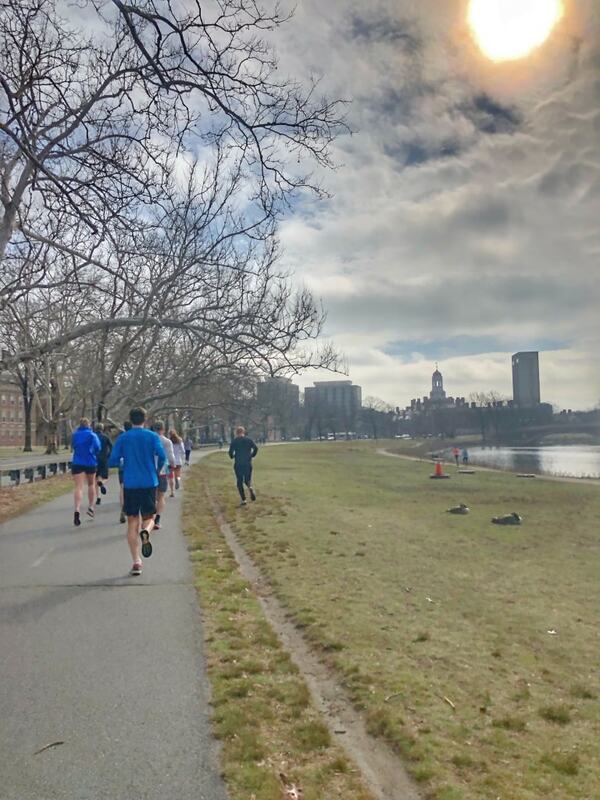 We ran along the water which was gorgeous – it was a beautiful morning for a run. Also, how amazing is this shirt?! My brother wore one too, lol. I didn’t wear a watch, but I kind of wish I had because the last mile was blazing – the leading group kept getting faster and faster thanks to some friendly family competition. ;) I think it was my first sub-8 minute mile in ages! Post-run we all gathered for Union Square donuts, Bagelsaurus bagels, and coffee. 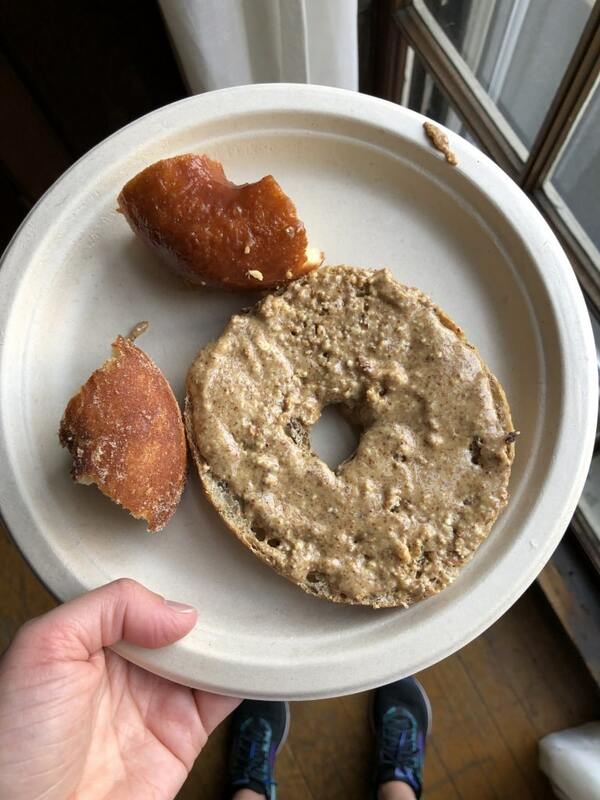 The cinnamon sugar donuts were my fave, so I went back for more! Matt and I walked by Flour bakery + cafe on our way back to our hotel and I grabbed a latte + a hard boiled egg to round out my breakfast with some protein and extra caffeine. It hit the spot! We also found this little nugget on our way back! Riese spent the morning with Matt’s parents, my aunt Janet, and my cousin Spencer’s wife Michelle (my uncle Tim and cousin Spencer were running the 5k with us). After getting cleaned up and getting Riese down for her nap, I met up with the bride, her mom, my mom, and the maid of honor to get our hair and makeup done! 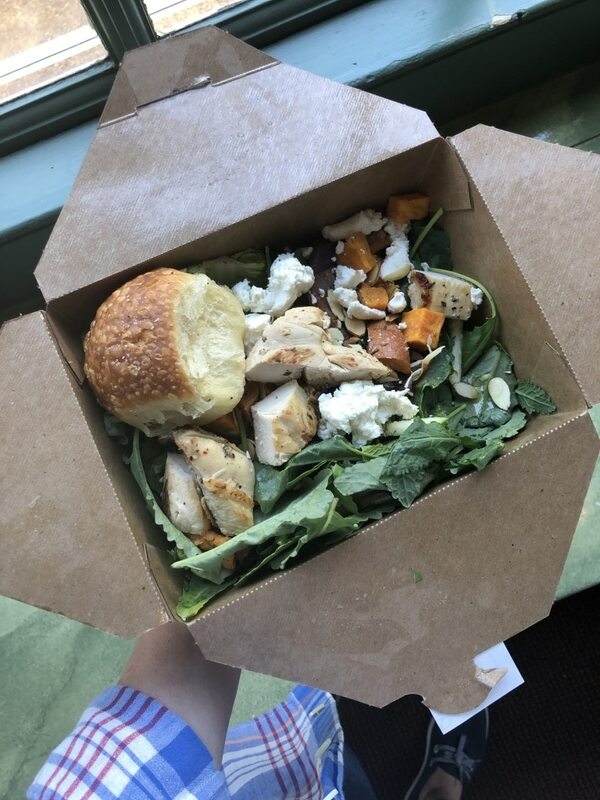 We also enjoyed some lunch from Tatte cafe that my brother brought by – I had the chicken and sweet potato salad with goat cheese and a cider vinaigrette, which was delicious. I was debating what to do with my hair and ended up going for half up, half down, with some fun braids in the mix! 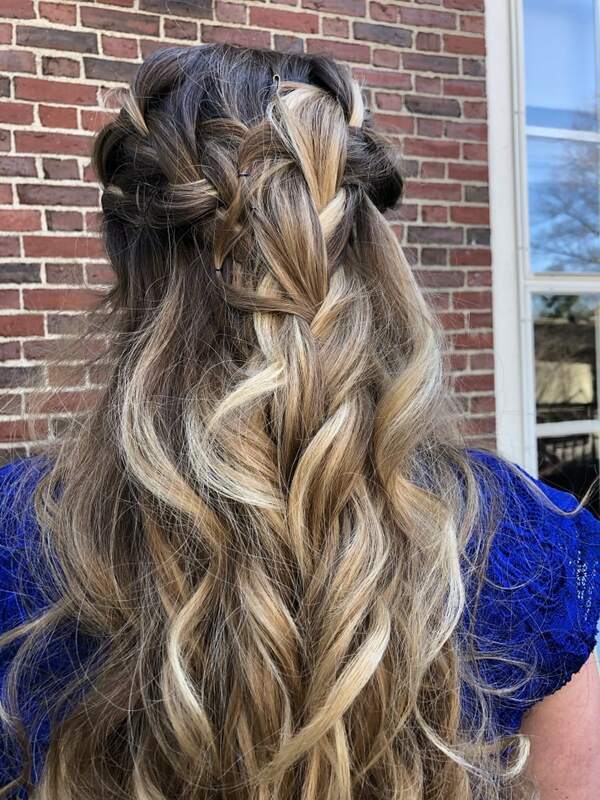 The hairdresser made it look really cool and it was easy to do – she basically just braided a couple sections, threw in some bobby pins, curled the ends a bit, and was done. 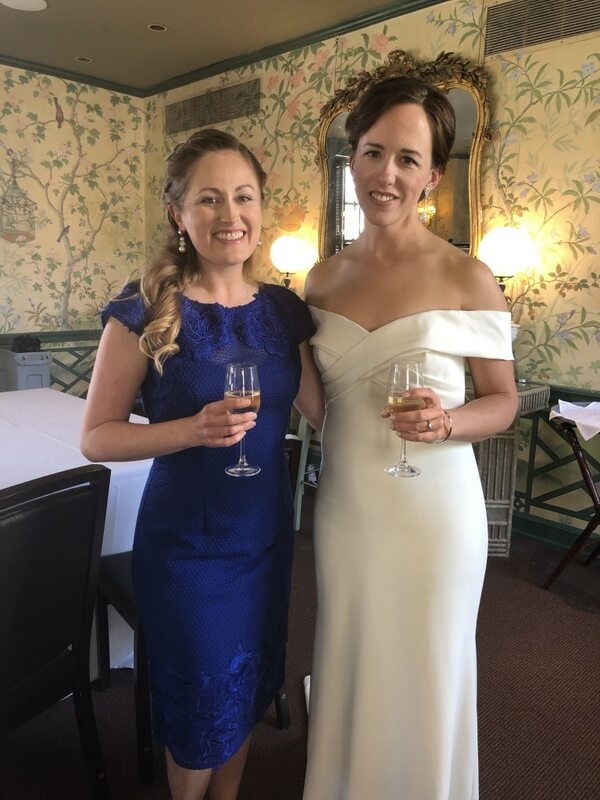 Here I am with the gorgeous bride, just before she went off to take “first look” pictures with my brother! 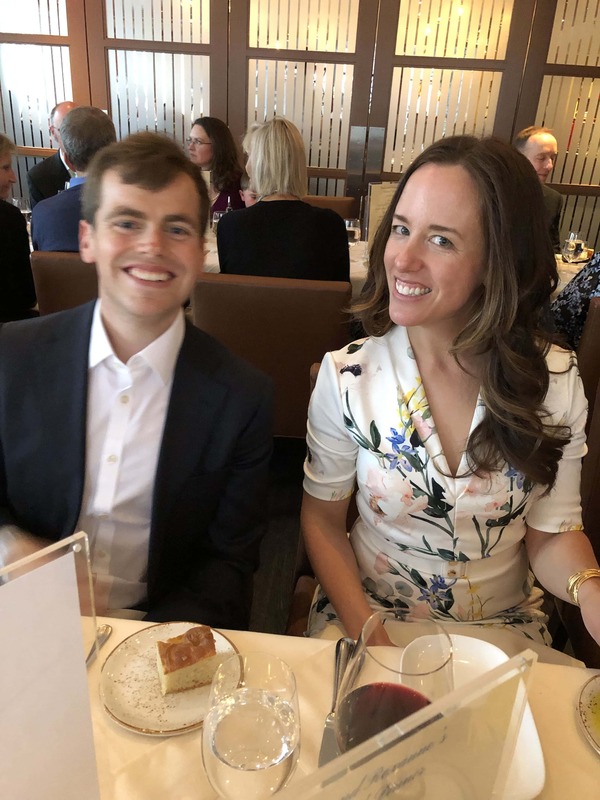 My dress is from Rent the Runway (<- affiliate link for $30 off first order) – it’s this one. After the first look pictures (which we creeped on from the windows, of course), Steve and Roxanne took the rest of their photos, including those with family! 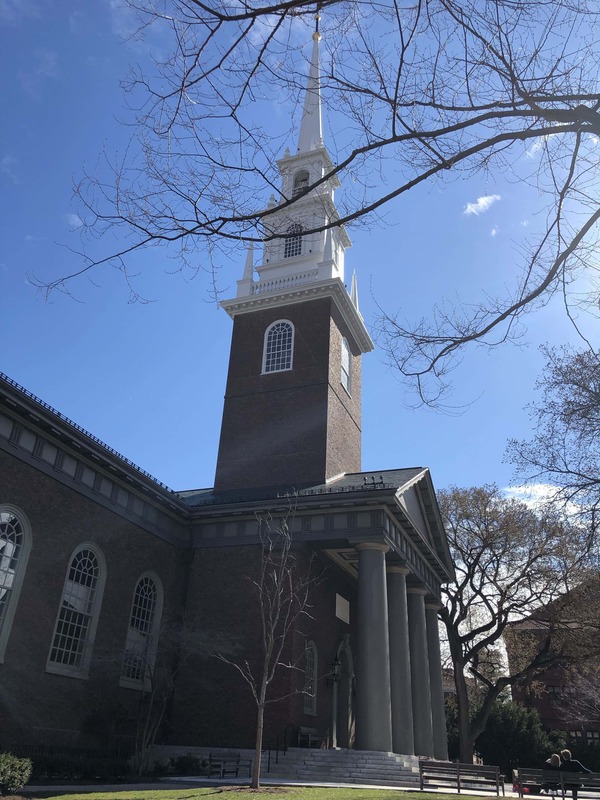 The ceremony was held at the beautiful Harvard Memorial Church. 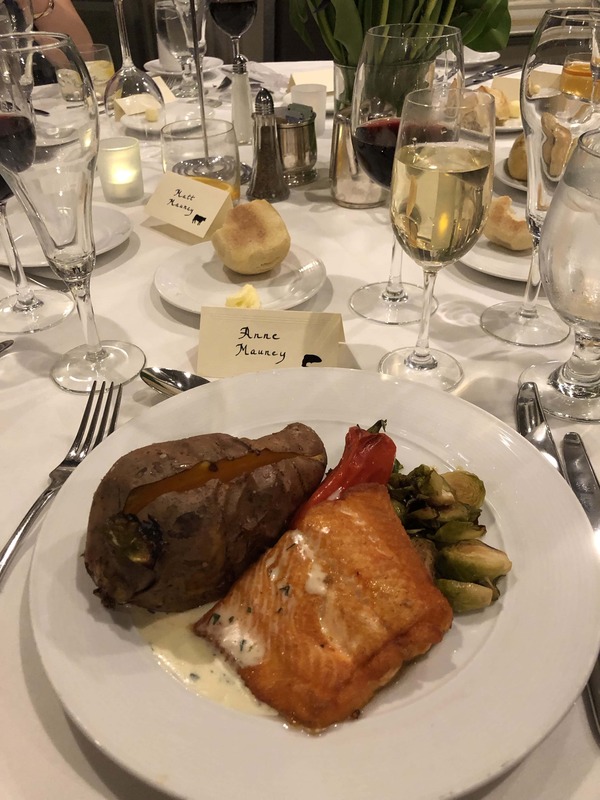 The reception was held at the Harvard Faculty Club a short walk away. 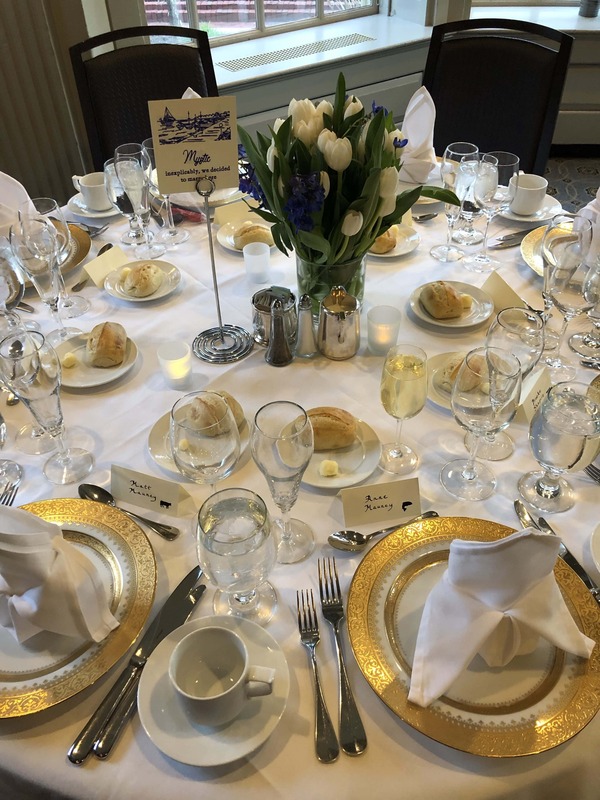 Each table was themed for a location that meant something to the bride and groom; our table was “Mystic”, for Mystic, CT, where they were when they apparently decided to get married! 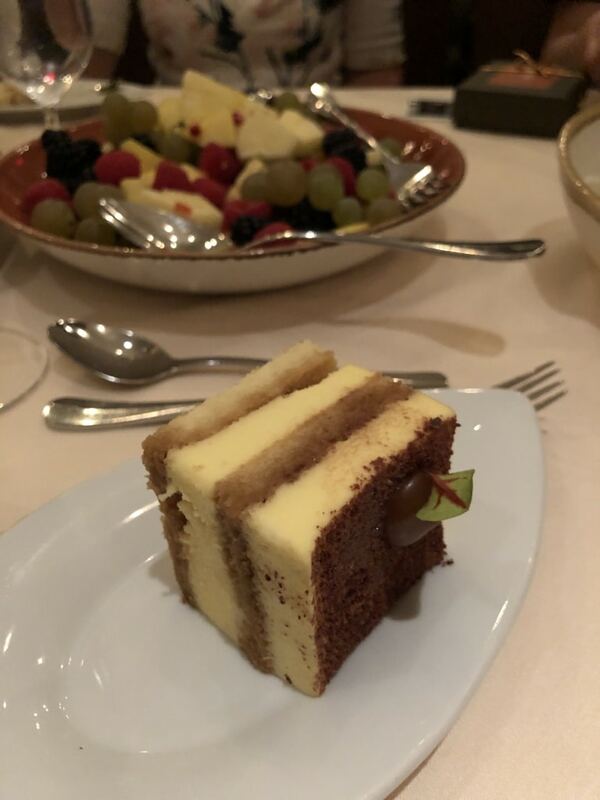 As was the cake, which I didn’t get a photo of, but it was carrot cake – YUM. 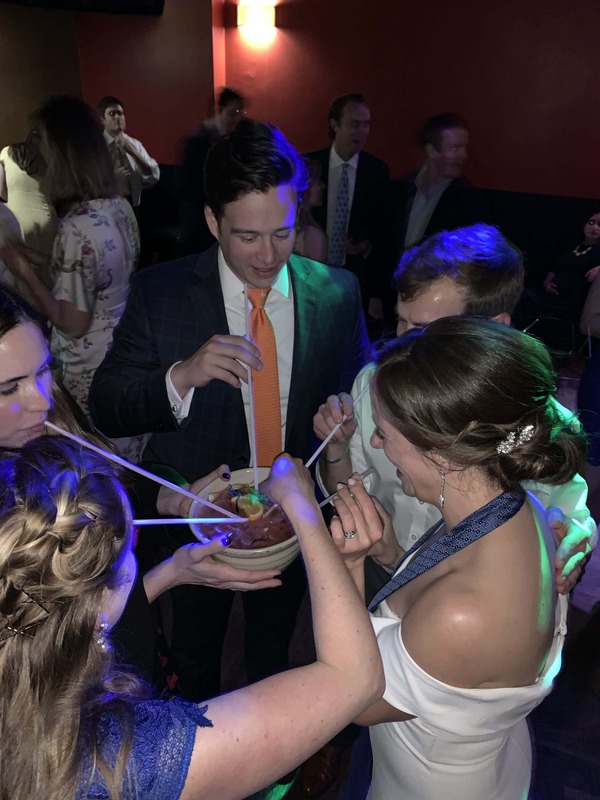 We danced the night away and even made it to the after party at a dive bar nearby that had “scorpion bowls” – basically alcohol + fruit juice and dangerously tasty. After not making it to bed until 1 a.m., morning came fast, that’s for sure! Especially with Riese waking up around 4 or 5 a.m. because she was not loving trying to sleep in a new place. Worth it, but oof. 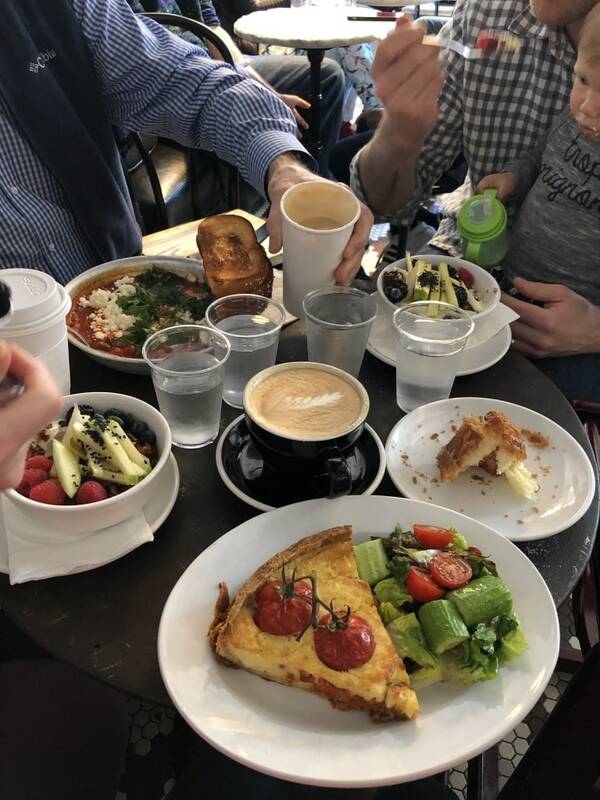 There was an official wedding brunch the next day, but not until 10 a.m., and we were up early with Riese and hungry, so we walked over to Tatte again for breakfast with Matt’s parents. I had the quiche + salad and it was delicious! Plus a much needed latte. 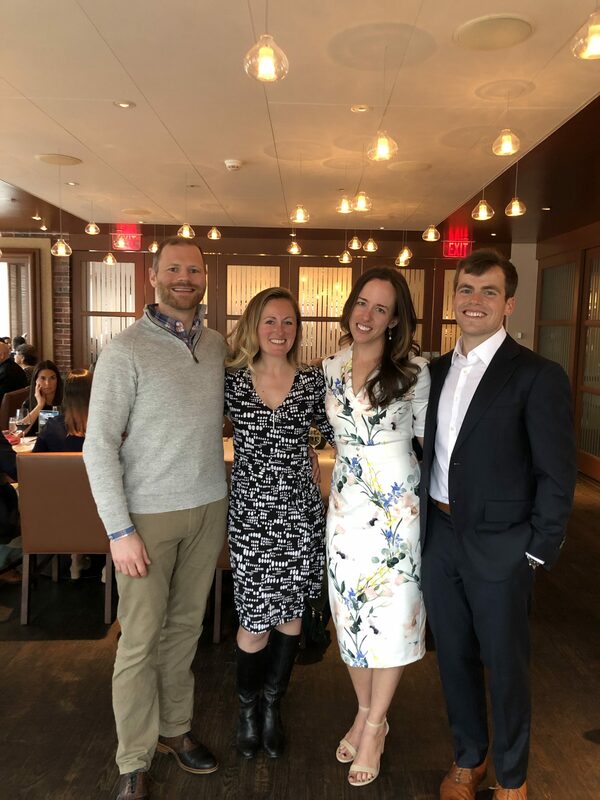 We headed to the airport after the wedding brunch – sad to say goodbye to the happy couple, but so glad to have been able to celebrate with them this weekend! 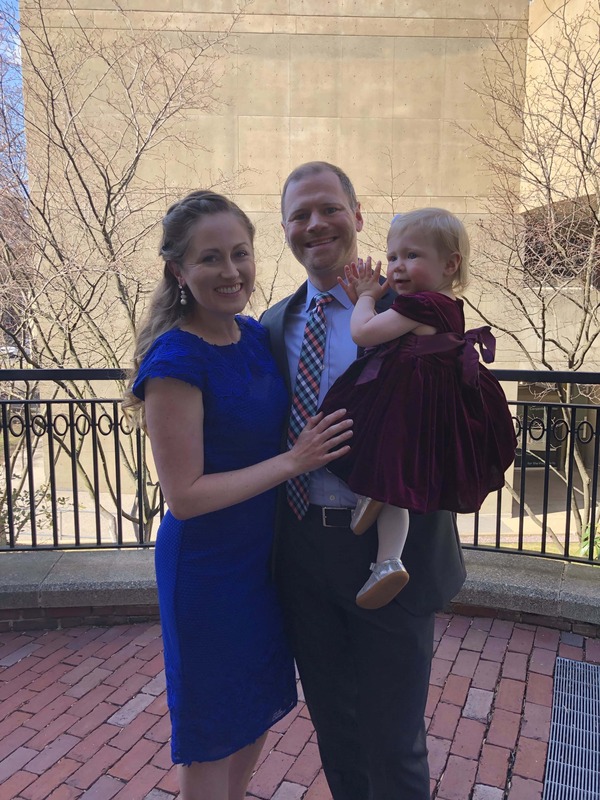 The trip home was pretty exhausting – when we originally booked our flights, Riese was still doing 2 naps, so we booked a lunchtime flight thinking she’d nap when we got home. Now that she’s down to 1 nap, we were traveling right over naptime, and Riese was not interested in sleeping and was all over the place. We did our best distracting with games, food, books, etc., until we gave up and pulled up some random game on Matt’s phone. Whatever works. Dinner last night once we were home and got Riese to bed was salads! I wanted something light and veggie-packed, and we had some random stuff to use up in the fridge. Greens + leftover barley + edamame + string beans + broccoli slaw + chickpeas + poppy seeds + feta + some shredded chicken that I made in the instant pot. Just put your chicken breasts in the instant pot, cover them with water, sprinkle in some salt and pepper, and cook on high for 15 minutes. 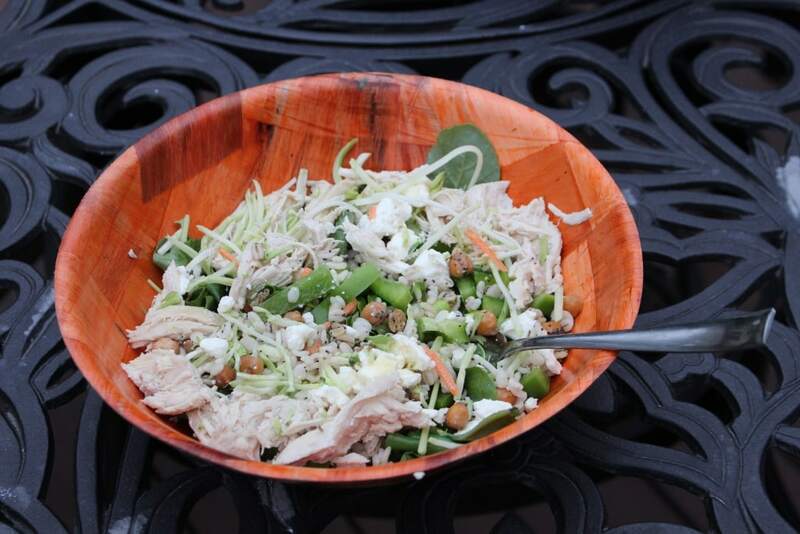 It was warm enough to dine al fresco – what a treat! Aww, what a fun weekend! Your SIL’s wedding dress was beautiful! So sleek and elegant! And I love the dress you wore. 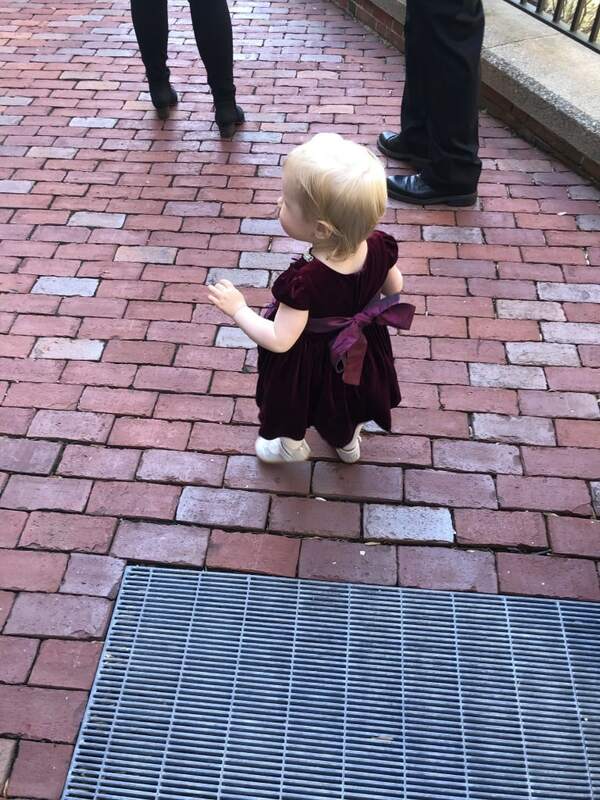 Riese looks adorable in her dress! That is so nice that Matt’s parents came for the weekend to help with Riese so you could really enjoy yourselves! That’s a win-win situation as I am sure they loved all the extra time with her. We are taking our first flight with our little guy this week. We are flying down to Florida for a quick getaway. Our flight out is during his usual nap time so hopefully he will cuddle up and sleep on me… we shall see! And our return flight is at 6:30 pm, which is close to his bedtime so I am hoping he sleeps on the flight home – fingers crossed! My parents are coming with to help out. We are hoping to get out for a date dinner or lunch or drink or something!! We will be driving around quite a bit so we are checking our carseat but we both get 2 free checked bags so at least we won’t have to pay for it. I’m nervous about how well he’ll sleep on the trip but hopefully it goes ok!! 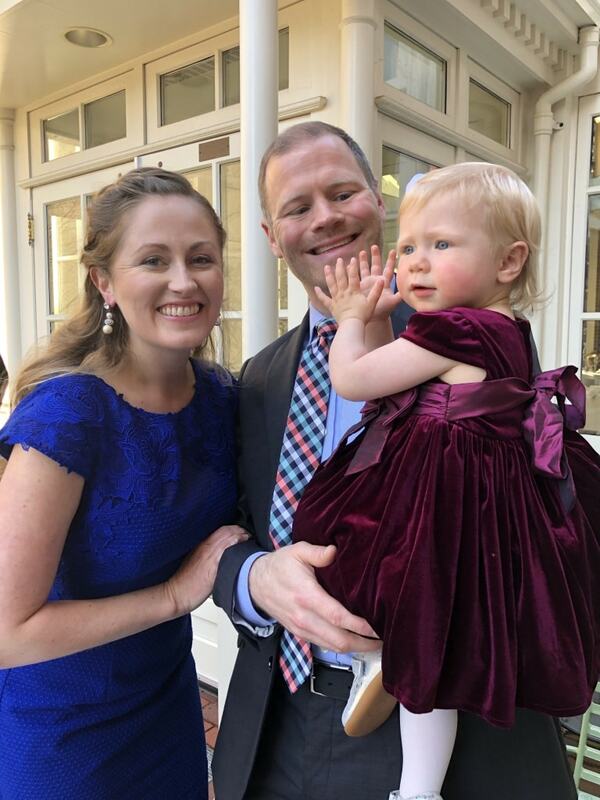 Yes, they did love the time with her – and so did some of our other family who was really excited to meet her for the first time! Fun to have her there but super helpful to have Matt’s parents around to take her so we could go to the various not toddler-friendly events. :) Good luck with your first flight – sounds like it will be a nice getaway!! meet Riese? And remember, we have guest rooms suitable for takeoffs to Yellowstone, Canada, the dinosaur museum trail in MT, etc. Love to all! Just so you know, you don’t have to pay to check baby gear! We’ve done the rentals before just to not have to lug things through the airport, but figured you should know it’s free to check strollers, car seats, etc. if you need to. Yes, definitely nice to not have to lug it around! Glad you had a good trip :) I’m in the DC area, too, in Silver Spring with a 2 year old, and it’s fun to see you go to some familiar places when you’re out and about in the city! We are going on a trip with our toddler next month and would love to know what rental company you used, if you don’t mind me asking! Looking to rent a crib, highchair, etc. We used https://www.travelingbaby.com/ and had a good experience! Looks like they are in a ton of cities. Easy to do it all online too. What an amazing weekend. I loved your blue dress and the dress of the bride. Rease was very elegant 😉 and so cute! Many congrats for the couple and blessings. 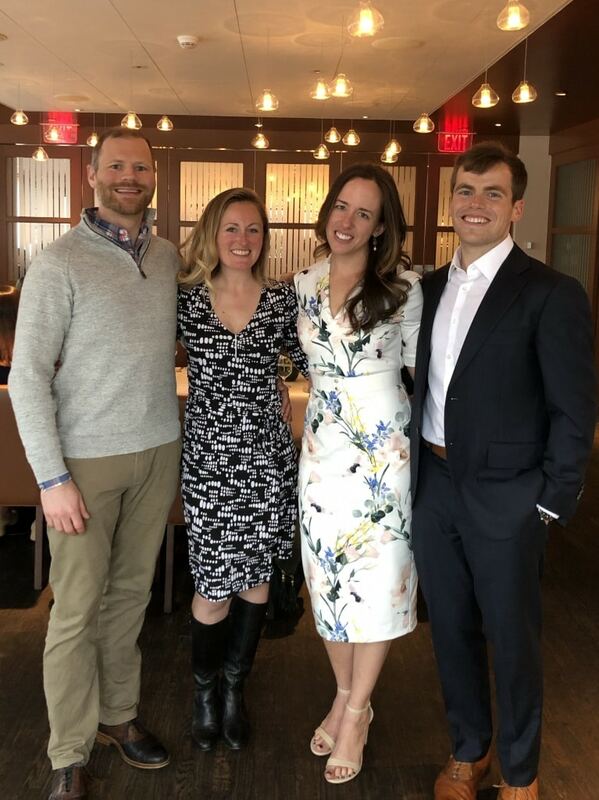 What a neat weekend – and a great recap. 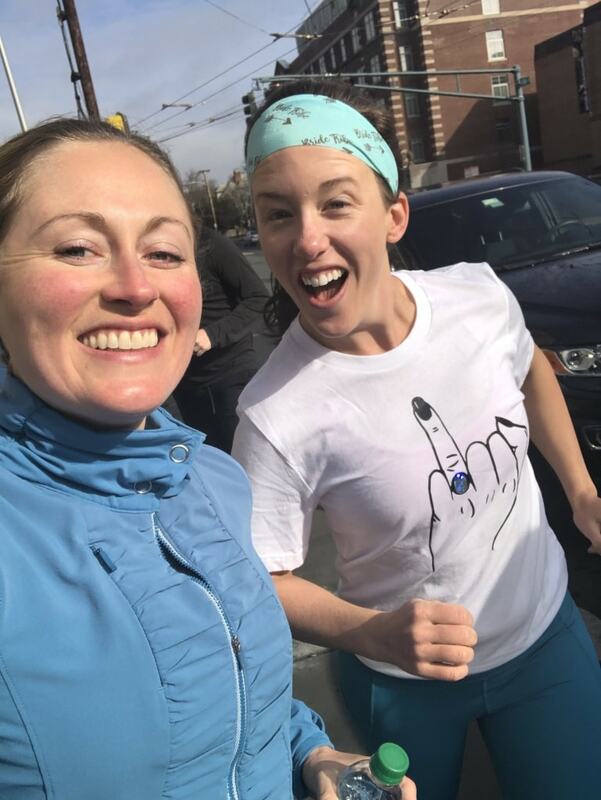 Sounds wonderful – and bravo for doing it all with the little one and still getting out for the run and the rest thanks to Matt’s parents. Well done! Congrats to the lovely couple. Sounds like such a fun weekend and “stop trying to make fetch happen.” Haha! Such a lovely wedding! Congrats to them!! It was so Harvard-y I was having flashbacks and lots of fun reading your post about all the Harvard adventures in my old hood ;) Riese looks darling in her party dress!! Yes!! I was thinking of you! 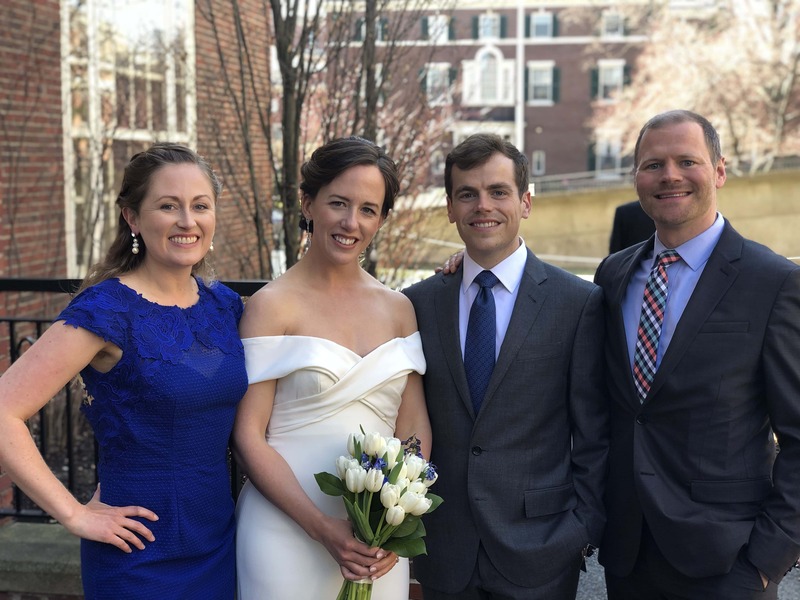 Wow, Anne, you looked gorgeous as did the bride! I adore that blue on you, and your hair looked so chic but effortless. What a fun celebration, and Riese looked adorable! So sweet, thank you Kori!